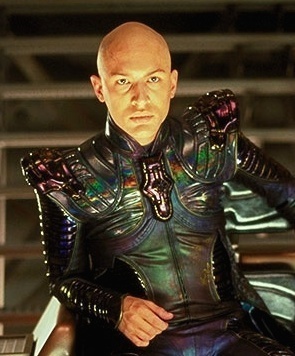 We reach the end of our Star Trek voyage with Nemesis, the 2002 finalé in which Picard (Patrick Stewart) confronts his evil clone Shinzon (Tom Hardy). You might be thinking: but Tom Hardy looks nothing like Patrick Stewart! And you’d be right. To quote Blackadder, they’re about as similar as two completely dissimilar things in a pod. In fact, Hardy seems to be channeling adolescent posh boy Prime Minister Pitt the Younger from that very series. It would have made a lot more sense to have Stewart in a duel role, like Brent Spiner who plays both Data and B-4. Or Tom Hardy in that new movie Legend, where he plays two versions of Alan Partridge. Shoulder pads look set to make a big comeback in the 24th century. Not only does Shinzon not look the part, his motivation makes about as much sense as Troi (Marina Sirtis) being given command of the ship at one point. No sense whatsoever. The weak plot is overwhelmed with action sequences, which are well done but not particularly Star Trek. Jonathan Frakes presumably wasn’t allowed back in the director’s chair after the beige disappointment that was Insurrection. He’s replaced by Stuart Baird, who hasn’t seen any of the other films in the series. And it shows. But it’s not all bad. Stewart and Spiner are pushed to the foreground once more, making this another enjoyable episode of The Picard & Data Show. The effects are back up to speed, Worf (Michael Dorn) gets denied and any excuse to have Data sing is wisely embraced. The ending does have a certain emotional impact and parallels with The Wrath of Khan. Unfortunately though, the plot has more holes than the Enterprise.